It is not often, during this nomadic journey of ours, where we both 100% agree on places we could see ourselves settling in for awhile. This may not be obvious to our regular readers as we often spout love for the destinations we visit. 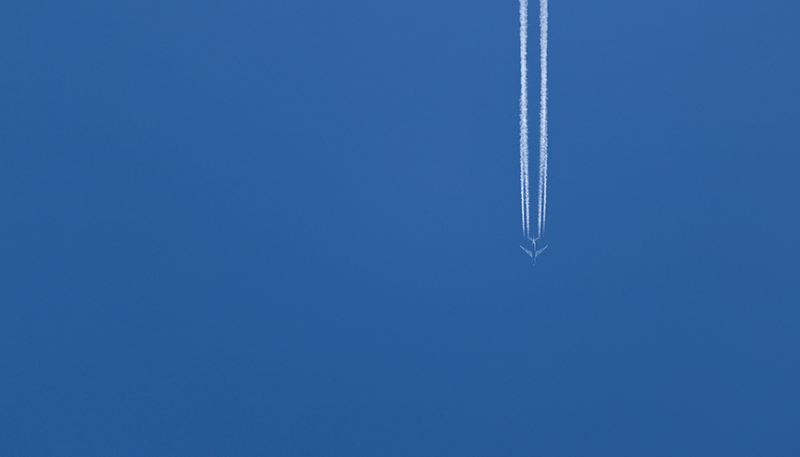 But, let’s be honest, travel is awesome. There are very rare occasions of our meeting a place that we don’t like. We’re glass-half-full people and it is pretty hard to disappoint us (with some exceptions). But Poland, oh Poland. We became smitten with you in the north, what with your orgasmic pierogies in Gdynia, your very friendly residents, and your BEACHES. Who knew you had such gorgeous beaches? Then we arrived in Warsaw, and while we typically aren’t big fans of larger cities, we felt very at home. We pained at the history, of Warsaw and its citizens being ravaged in WWII, but were encouraged by the outgoing friendliness of the residents. 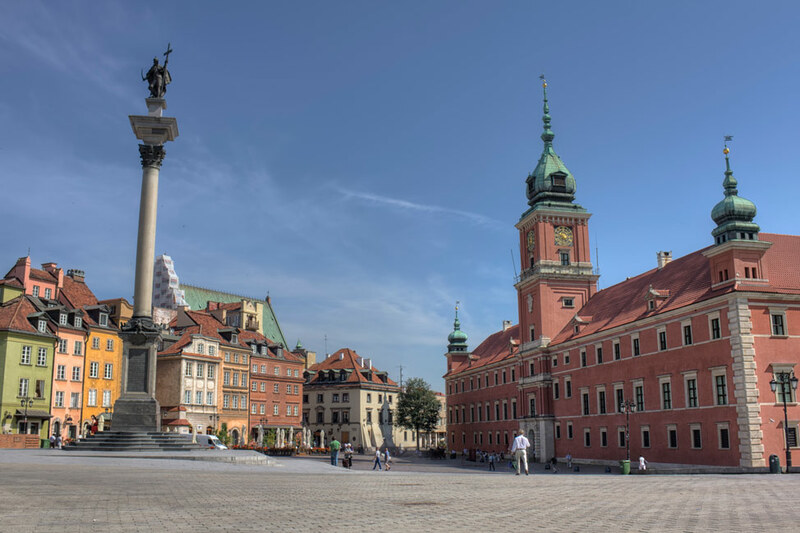 And while the historic downtown suffered a similar fate to Gdańsk – being completely destroyed and built back up – none of the appeal is lost. If anything, it is an enlightening example of the enduring power of the human spirit, to be able to persevere and completely reassemble a city from chaos and destruction. If anything, Warsaw is an enlightening example of the enduring power of the human spirit. 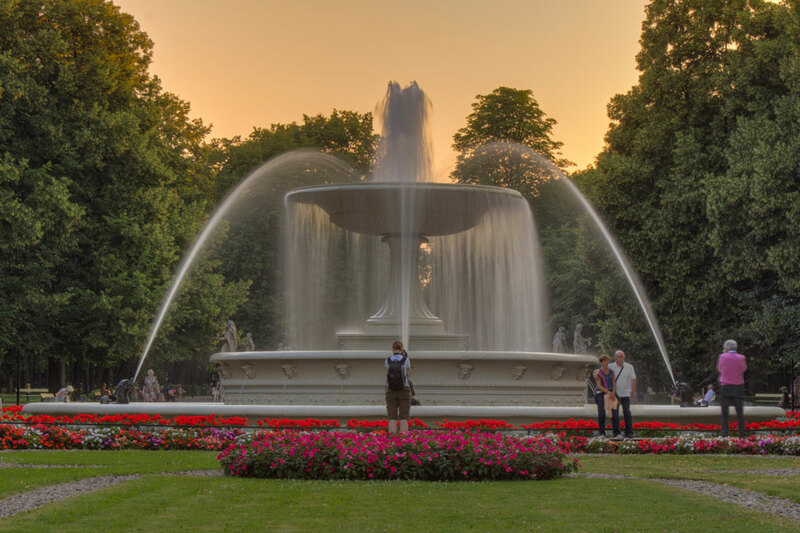 Warsaw is almost one quarter green space, and the parks are something to behold. Lavish fountains, former palaces as museums, ample places to escape from the city without escaping from the city. 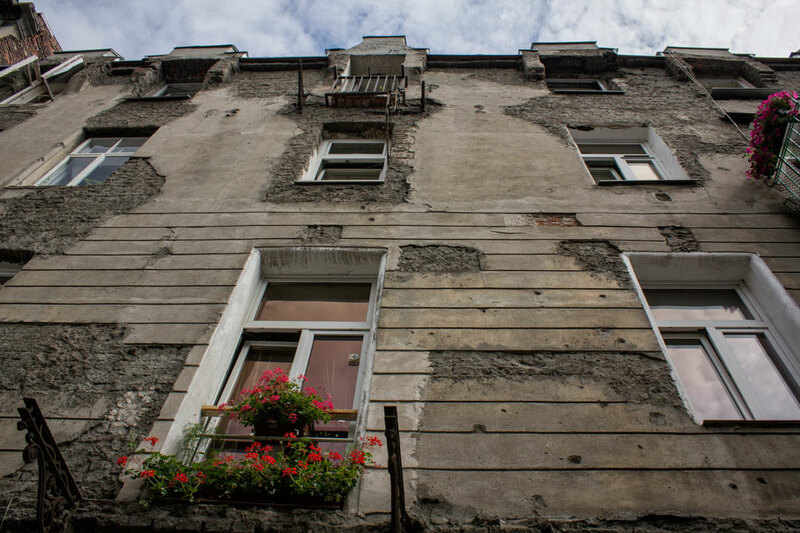 Every few stops on the tram seemed to open us up to an entirely new environment – across the river in Stara Praga were buildings not destroyed in the wars but still standing, some riddled with bullet holes. The style of Soviet realism is most apparent with arching blocks of massive buildings in the aptly coined area of Plac Hipstera (and still the odd neon sign). The neighbourhood of Saska Kepa appears the most liveable of all, with wide, inviting streets dotted with local shops. Each community far from the standard tourist eye, yet begging to be explored. And even though it’s a bit more expensive than other parts of Poland, it is still very cheap by European standards. Like, ridiculously so (I can’t believe more travelers aren’t here). After ten days, we found ourselves looking at apartment rentals (but deeply scorning Schengen visa rules – why do you not want us Europe?) 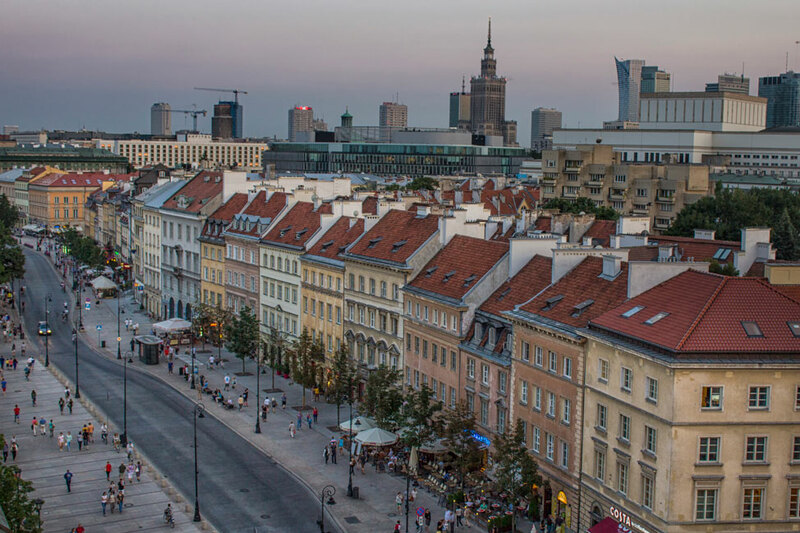 There are few places where we could see ourselves abiding long(ish) term – and Warsaw has become one of them. 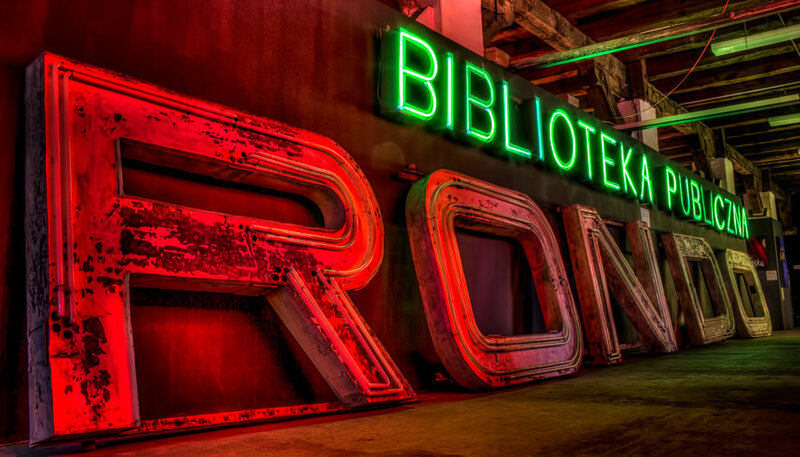 The many purposes of neon signs in communist Poland. Where Shall We Sleep Next? We'll take it where we can get it. I hear you! I shake my fist at the Schengen rules regularly. Will have to add Warsaw to my list for when I’m back on that side of the pond. I think Poland doesn’t get enough credit as a great destination. I hope you do go! True. I’ve lived in Warsaw for 1.5 years and have travelled the country. So many nice cities! And evry very cheap! DJ Yabis | Dream Euro Trip recently posted..Adventure Underwear: The Best Travel Underwear for Fastidious Travelers? We do the exact same thing and try the places we visit on for size. But it’s hard for a single place to compete with “everywhere.” Even in places we absolutely love, we wonder how long it could possibly keep our attention when there are so many new places to go and explore. Once you realize you don’t have to settle in a single place, it’s hard to think of a good reason to settle anywhere. Yes, you did tell us! But I like the nickname better. 🙂 We hope to see you again soon too! After reading your depiction of the city I think I could live there too 🙂 Great photos! That Schengen agreement kills me! We had to adjust our plans drastically after finding out about that one. Sigh. I love the umbrella canopy. I know, what a pain, right? We want to just come and spend some money y’all – let us in! I loved my time in Warsaw a couple of years ago. I just wish I hadn’t planned it as a quick stop over on my way to Krakow and hung around longer. Still have fond memories of the massive beer I bought from the restaurants in the old town square while enjoying the sun. So thrilled that you’ve fallen in love with my homeland – a place that my family and I had to leave for Germany and then Canada, shortly before the fall of the Berlin Wall. I have family living in this part of the world, so I’ve always wanted to visit. LOVE these pics!!! Andi, you really should make it there and look up your family! Poland has really been so enjoyable for us, and we’re so surprised that more people don’t travel here. Hi Dalene, I’m new to your blog but love that your mom visited you in Turkey. My husband and I are from the states and would like to live and travel in eastern Europe. Best for us is to stay in one place for 2-3 months. Would like to connect with a group of people willing to rent apartments in various places and use them like timeshares. Any ideas? Hi Martha – welcome! OOh, that sounds like a great plan, but I honestly wouldn’t have a clue as to how to start. There are LOTS of apartments available for rent via such things as airbnb, or perhaps if you show up in a place (stay in a hotel for a few days), you may be able to find someone who could help you locally. Sorry I can’t be of more help! Wandering Earl just blogged about how he got a temporary residency in Romania. Holy Dinah…that’s a huge fountain & I loved the umbrella cafe canopy. It makes a person feel happy. Going to have to go to Poland. Still haven’t made it to Poland, was supposed to go in a few weeks, but another trip came up instead. Interesting that you love Warsaw so much, I hear more about Gdansk and Krakow, but not so much about Warsaw. Ha! You and me both. Can find furnished ones in great neighbourhoods for less than $500/mo! Those three reasons there I can completely agree with. Especially re. the green spaces! That umbrella canopy is beautiful! I’ve not yet had the chance to visit Warsaw (yet another European city I overlooked while too busy running off to the other side of the world :/ ) it looks like a really amazing city with all the green spaces, and I love architecture! It’s the green spaces that really did us in. They are so spacious! Thanks Tom! I know that most people prefer Krakow, but both Pete and I liked Warsaw better. I think it’s the green space, and how it just seemed much easier to navigate. Lovely article! We all have places that we fall in love with and it’s brilliant to hear your perceptions of this city. 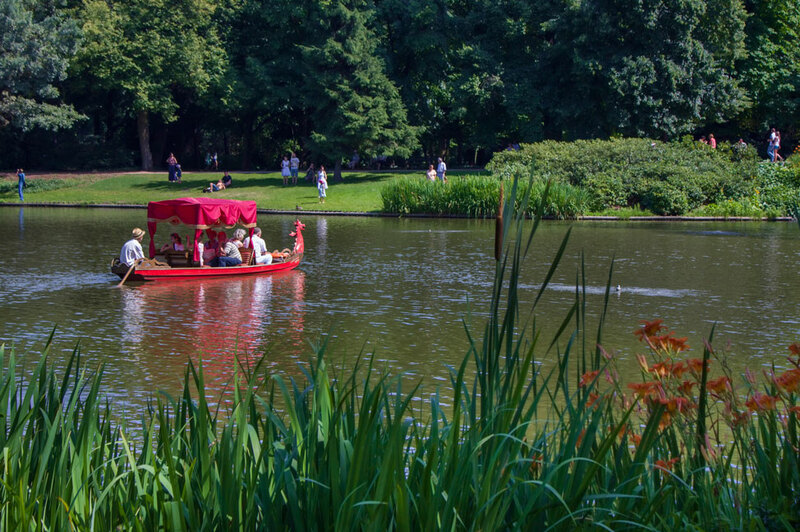 It’s great to read about the resilience and friendliness of the Polish people as well as the fabulous green spaces, cultural venues, and diverse neighbourhoods in Warsaw. 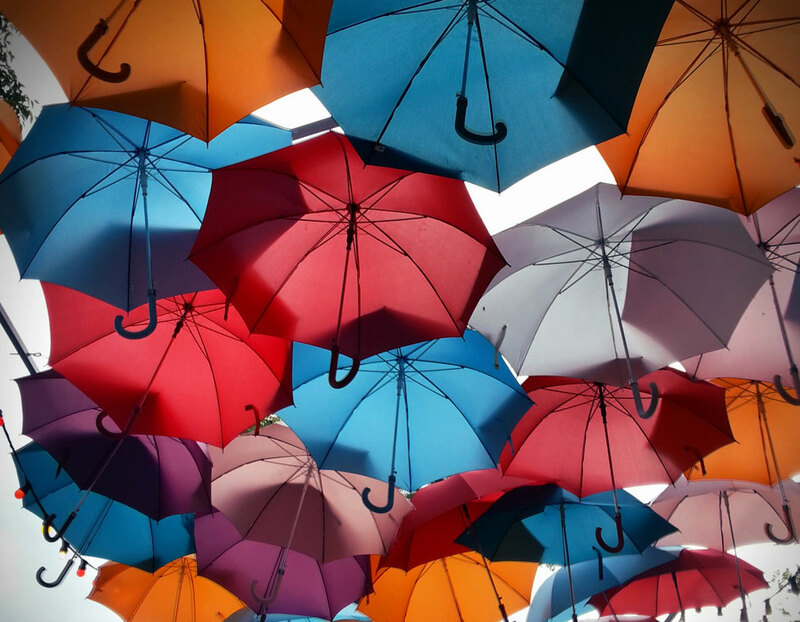 Great architecture, color and wow – love the umbrella shot – wonder what that looks like at night. Ugh, why does Tim have a job he can’t get out of for 7 more years?! I want to be able to just go and explore whenever it suits my fancy. 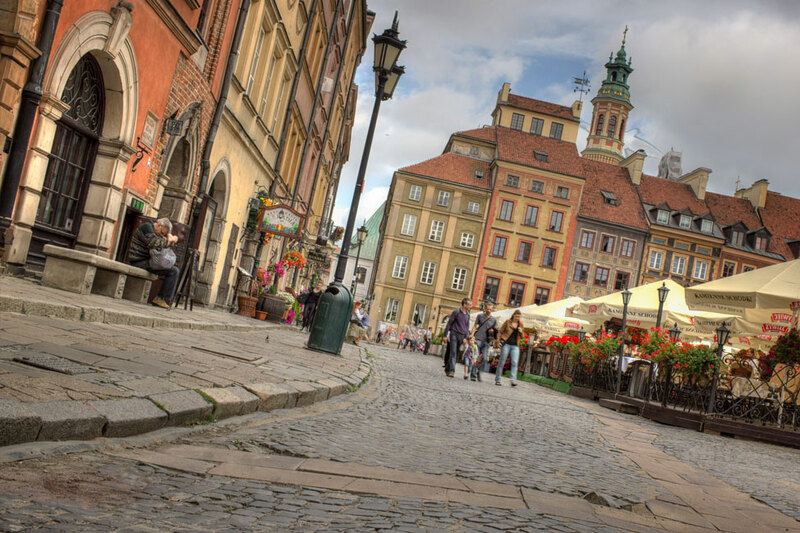 Were thinking of squeezing a quick trip to Poland in over a 4-day long weekend, but after following along on your trip, that doesn’t seem like enough to see all I want to now! I KNOW. Beaches. I had no idea either – but the Baltic coastline is pretty nice. Oh my god, it’s gorgeous. I remember when I first entered Prague without knowing what to expect and being floored. Warsaw reminds me of that!!! I don’t hear a lot about Warsaw as a travel destination, much less a place where someone wants to settle down. But why not?? I’m anxious to go there after seeing your pics. Looks like a place I’d love to spend some time in. The umbrella cafe canopy is totally cool. I agree! I lived in Warsaw for about 2 years just after the fall of communism and loved it. It does indeed look lovely. There are SO MANY places like this in Europe – awesome, but kind of unexpectedly so. That Schengen visa situation for non-EU citizens is unfortunate, indeed. Warsaw is definitely somewhere I’ll be returning! I really want to explore Poland one of these days. As close as we are, it’s still quite a ways from Freiburg to Poland, and I don’t want to go until we can spend at least a few weeks there. Love the pictures! I had the same reaction to Budapest recently. Though 75% of it was destroyed in the war, you’d never know it. The restored buildings look unchanged from Hapsburg times. But beyond the beauty, the parks and cafes make it extremely livable. We’d love to settle down in Budapest for a while so maybe it will be in the cards for us – hopefully the same will be true for you and Poland! Hmmm…we’re leaving next week for 5 weeks in Poland and the Czech Republic. We won’t get to Poland until the beginning of October, so was considering just visiting Krakow and Zakopane. But your description of Warsaw has got me redoing our plans! We’ve got 5 full days in Krakow and 6 in Prague. I can’t wait! Thanks for your blog and picks. I find that all of Central and Eastern Europe is more interesting and relaxed than Western Europe. I visited Poland a number of times in the past but my most recent visit was unplanned and the most enjoyable. I always preferred Krakow for tourism but not after this last “accidental” stay in Warsaw. I was flying from California after a rare visit back home, and flying to my adopted home of St Petersburg. The consulate made a mistake on my visa by transposing two digits and was refused entry into Russia. My last connection was Poland so they sent me back there(they charge $832 for the 90 minute flight!). I had few clothes with me, since they were in St Petersburg and no idea of where to stay and little money. The Russian consulate fixed the problem quickly but instead of getting back to SPb, I just stayed for another 3 weeks and had a ball. Made a lot of friends, had some great meals, a couple concerts and a hundred miles of walking in the city center and Old Town, took thousands of photos with my new 36mpx 35mm camera. Accidental visits to somewhere almost always turn out better than those planned carefully. I will return, but I find that living in St Petersburg is so much fun that it is hard to get me away from it. I’ve been here 10 years and find that I am bored silly within 2 days of visiting back to the US. Luckily, Americans can get a new 3 year multiple entry visa to Russia that allows 6 months in and immediate re-entry for the next 6 months, and repeating until the 36 months are up. 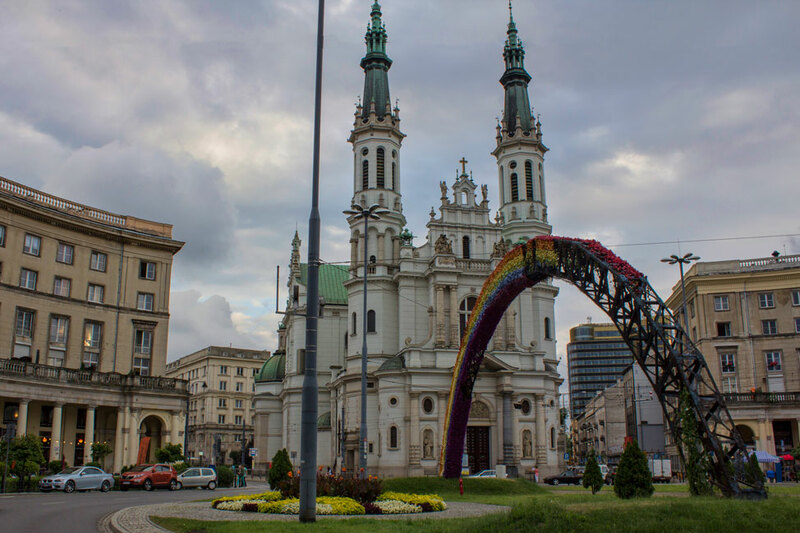 Great post:) I have actually lived in Warsaw for almost two years and still visit this city quite often. It is definitely my favourite Polish city, so beautiful and diverse. One of my favourite spots in Warsaw is a bar in the Old Town called Bubbles. I used to spend so much time there! As the name tells they mostly focus on champagnes and sparkling wines but they also serve delicious food, like tomato tartare – just incredible. It is aplace where I also go while visiting Warsaw. Great photos! I don’t know if I could live in Warsaw myself, but I do love visiting the city. It is so lively and interesting! I love exploring all the amazing places there. One of my favorite discoveries is the Akademia Restaurant in Mokotow. It is incredible, romantic restaurant with delicious Polish food but in more modern versions. I always go there to meet with my friends from Warsaw and we are always delighted!